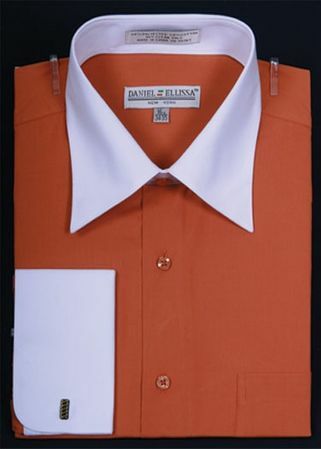 Get out of that comfort zone you have parked yourself in with some new 2 tone dress shirts by Daniel Ellissa. When style counts and You know that it does. A new 2 tone style dress shirt will bring up your look several notches. This rust and white 2 tone dress shirt comes like it's shown with the white collar and french cuffs. Made of cotton/poly.